Parenting is hard. Being responsible for shaping future generations is a huge responsibility and oftentimes feels like an overwhelming task. So many things in our culture pull at our children, and as parents, we find ourselves simply trying to keep our heads above water and do our best. Through the years I have had many conversations with other parents in regard to raising children, and it seems that we all struggle with the same basic questions: How do we get our children to be good kids when they are growing up in a godless society? How do we keep them in church? How do we get them to read their Bibles and pray? How do we get them to make right choices when they are faced with the pull of this world? How do we get them to walk with God? The answer is, we don’t. Now some of you may start preaching the biblical standards for training up a child and quoting the “spare the rod, spoil the child” scripture, but before you do, let me tell you where I’m coming from. I absolutely believe that the discipline and correction of our children is biblical and necessary. When they are young, it is imperative that they learn right from wrong, boundaries, and good manners and receive all the behavioral training that little ones need. I believe we should start teaching these principles early and be consistent with them. I’ve raised four little ones, so I know how it goes. However, once our children get to a certain age, and are able to make moral judgments for themselves, we need to start focusing less on their behavior and more on their hearts. If the hearts of our children are set toward the Lord, then their behavior will follow. As a mom of teens, at times I find myself trying to control my kids’ decisions, actions, and responses rather than focusing on shaping their hearts. In doing this I encounter resistance and frustration from my children. This is not necessarily because they want to be rebellious, which is what we may naturally think, but because they are learning to walk out their lives independently with the Lord, and I am getting in the way! If our children are going to live in true and lasting relationships with Jesus, we have to step back and let the Holy Spirit convict and teach them—just as He convicts and teaches us. Our kids should not live to please us, their parents; instead they should live to please God. Out of love for Him should flow their obedience, respect, and honor for us. Now I’m not suggesting that parenting will always be a bed of roses and we will somehow grow perfect children! Will our kids make mistakes? Yes. Will they cop an attitude now and again? Absolutely! Will they get discouraged? Yes. Will they make unwise choices that get them into trouble? Of course. Might they walk away from the Lord for a time? Maybe. But doesn’t this also describe us? There comes a point in time when our role is to disciple our children’s hearts and choices, not dictate their behavior. Our children’s relationship with the Lord is theirs, not ours, and it may look different than what we expected. Their lives may be led in a different way than we desired, and this is where we have to be reminded once again that we are raising arrows in order to release them. The key word is release! An arrow kept in the quiver has no use and will never be effective. If our children are going to develop solid, real, and lasting relationships with Christ, we have to get out of the way. Our responsibility is to be quiet and allow God to speak so our kids can hear Him. If our children don’t learn to recognize the voice of God when they are young, then they will always be looking to others for direction and will likely be misled. So instead of telling our children how to live, we need to show them by example. 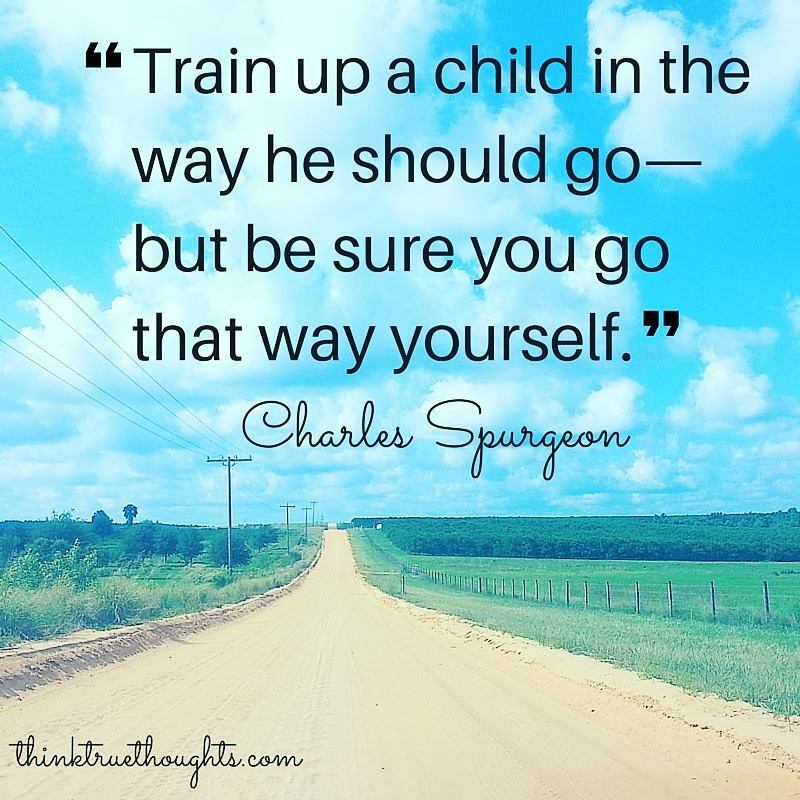 I recently read a quote by author and preacher Charles Spurgeon that says, “Train up a child in the way he should go—but be sure you go that way yourself.” How can we pass on something we don’t possess? Our children will look to us when they are young and become like us as they grow. We can’t expect them to become spiritual giants if we live lives contrary to the one we are telling them they should live. We should pray with our kids! When they have a question, or when an issue arises in our homes, our responsibility is not to preach at them; we should go with them to the Word; go before the Lord together. We need to let God’s truth speak to their hearts and allow the Holy Spirit to bring change. He is on His own timetable, not ours! Lord, help us shape our children into that which You have called them to be by getting out of Your way and trusting that You will guide, direct, and speak to them. May we find joy in the relationships our children develop with You. Give us Your grace to walk alongside them day by day! Amen. In the United States, Mother’s Day is just around the corner. To some this is a blessed and happy day—a day when we celebrate being mothers and spoil our own mothers. To others it is a painful reminder of broken and lost relationships or of mothers who are no longer on this earth. There are also those who long to be mothers but for some reason have not been able to have children of their own. Regardless of the circumstances we find ourselves in, one thing I know for sure is that the role of motherhood, be it physical or spiritual, is dear to God’s heart and vital in our world today. Unfortunately, in our culture the role of the mother is oftentimes cheapened and devalued. Women are deciding that they don’t want to be mothers and disposing of their babies because they are a “mistake” or an inconvenience. However, God holds the role of mother in high esteem. Behind every great man and woman who has walked this earth, most of the time you will find mothers who have prayed, encouraged, supported, and sacrificed for them, often without the recognition they so rightly deserve. One such mother is Jochebed. Have you ever heard of her? I hadn’t either, until my dad (who was also my pastor) mentioned her in a sermon a few years back. Since then I have had the utmost admiration and respect for her. She is mentioned by name just twice in the Bible, and only in genealogies (see Exod. 6:20; Num. 26:59). Even so, Jochebed gave birth to one of the greatest men in history—a man who changed the world and was a hero of the faith: Moses. Most of us are familiar with the story of Moses, right? The little baby that was placed in a basket in the river and saved by the Pharaoh’s daughter. We’ve heard it over and over. But what do we know about the woman who was responsible for placing him in the river in the first place? First, Jochebed was aware of what was going on in her culture. She knew that Pharaoh had decreed that all Hebrew baby boys should be killed at birth. Knowing this, she took action by hiding Moses after he was born. When it comes to things happening in our society, how often have I said things like, “Oh, I’m a Christian; that doesn’t apply to me,” or, “I homeschool, so my kids aren’t at risk”? Unfortunately, we can no longer put our heads in the sand and ignore the culture. People are seeking to dispose of our children, and we need to be proactive in protecting them. Second, Jochebed was brave. She risked her life by hiding Moses. Can you imagine the stress of trying to quiet a screaming baby in the middle of the night, knowing that if you are discovered, that baby will be killed? Jochebed did what she needed to do, and when she could no longer keep her baby a secret, she was, like any mom would be, resourceful and came up with a plan. Third, Jochebed trusted God and let go of her son. This part of the story just makes my stomach turn. Can you imagine putting your child in a basket on the water and letting him go, not knowing what the outcome would be? But Jochebed did it. Hebrews 11:23 says, “They [Moses’ parents] saw he [Moses] was no ordinary child” (NIV). Jochebed knew her baby was special, so she trusted God with his life. How often do we hold on to our children when God is calling us to give them and their futures to Him? It was no easy task, but Jochebed released control and put the future of her son completely in God’s hands. Last, God blessed her sacrifice and gave Jochebed’s son back to her. Jochebed was not only asked to nurse and care for Moses by the Pharaoh’s daughter, but she was paid to do so! We will never be able to out-give God. If we are willing to release our children into His hands, He will always honor our giving. Because of the decision Jochebed made as a mom, her son was spared and raised up to eventually lead the Israelites to freedom. Do you think Jochebed knew what Moses’ future would look like? I highly doubt it. But she knew her God! Ladies, we have so much to learn from Jochebed. God loves our children more than we ever could. Just think, we may be raising giants who one day will change history; we may be raising future moms and dads who will reshape the culture and bring it back to where it should be; we may be raising missionaries who will win countries for Jesus; and while some of us may not have been able to have children of our own, we all have the opportunity to be spiritual mothers to others whom God has placed in our lives. Whatever the case, we can rejoice in the opportunities we have. Just like Jochebed, we may never be lauded or acknowledged publically, but our reward is in heaven, and we will one day hear from God Himself, “Well done, good and faithful servant!” (Matt. 25:23, NIV). As I sit here writing this to you, you are in the midst of a cultural war against manhood. The message that is being shouted into our society is not one I want you to hear or listen to. What I want you to hear is this message from me: you were created in God’s image. He has a purpose for you. You were born to lead, provide, love, and serve. That is how your dad and I have raised you. So walk forward and grow to be men, my sons, and don’t be ashamed of who God has designed you to be. Go ahead and blaze the trail through the woods with your machete, my sons. Because one day you may lead a nation. Go ahead and learn to responsibly and respectfully use that gun, my sons. Because one day you may need to protect your own families. Go ahead and love your country and those who have served for your freedom, my sons. Because one day you might have to fight for them. Go ahead and climb that tree, my sons. Because one day you may need to rescue your daughter’s kitty or save your son’s kite. Go ahead and hunt those deer and snag those fish, my sons. Because one day you may need to provide food for your families. Go ahead and learn how to build a fire, my sons. Because one day your own children will learn that sometimes they need to go back to basics and be content with simple entertainment. Go ahead and knock down that bully, my sons. Because one day you may have to defend the weak and helpless. Go ahead and dig in the dirt, my sons. Because one day you might have to toil to make ends meet. Go ahead and lift those weights, my sons. Because one day you might carry someone to safety. Go ahead and love others, my sons. Because one day you will have to show the world that real men can be kind and compassionate. Go ahead and dive into God’s Word and get to know Jesus well, my sons. Because one day the world will look to you for the answer to its problems. Go ahead, my sons. Be real men, my sons. Your world needs you. Have you ever felt weary from the fight? Does the state of our society ever weigh so heavily upon you that you just want to throw your hands in the air and give up? I will be the first to raise my hand and say yes! Day after day we wake up to news of violence, scandal, disaster, immorality, and death. At times I have found myself in fear for my children, who are growing up, and will possibly be raising their own children, in this day. I wonder how things will look for them as they become adults and seek to live out their faith in the midst of growing opposition to the things of God. It’s pretty discouraging when young people tell you that they question even having kids when they get older simply because of the way the world is going. In light of all this, it is very easy for us to get discouraged. We think back to the good ole days and wish we and our children had been born in better times. But if we allow ourselves to be overcome with fear and discouragement, we will become ineffective and unable to do what God has called us to. It is no accident that you and I and our children and grandchildren were born at this time in history. As we look to God’s Word for answers regarding our society, we find Esther. Esther lived in a culture similar to ours. The nation she lived in was morally bankrupt, the region was under the rule of godless leadership, and there was seemingly no prophetic voice anywhere to be found. This is why I love and relate to her so much. She was just like me, just like you! Yet even in the midst of a seemingly hopeless situation, God used Esther to save her nation. Can we really save a nation like Esther did? Esther was just a regular person. There was nothing particularly special about her; in fact, her parents had both died, leaving her an orphan and at a disadvantage in life. We are told that she was young, beautiful, and won the favor of everyone around her; other than that she was ordinary. But Esther was willing, and through that willingness, she changed the course of history. How did one young girl take on a kingdom? She denied herself. Esther asked for nothing before she approached the king. She came before him as she really was, not pretending to be anyone else (see Esther 2:15). She held to her beliefs when she could easily have compromised. Esther knew what was right and stood her ground (see Esther 2:20). She was proactive and patriotic. Esther loved her people and was willing to sacrifice everything in order to mediate for them. She instructed her people to pray and then stepped out to be their spokeswoman (see Esther 4:15–16). She was obedient. Esther submitted herself to her Mordacai, (her cousin who adopted her after her parents died) who had ultimately challenged her to rise up. He put the fate of the Jewish nation upon her shoulders, and she rose to the occasion (see Esther 4:14). She was courageous. Esther defied custom, put on her robes, and, risking death, approached the king (see Esther 5:1–8). She spoke up. Esther didn’t care what the consequences were. She petitioned for what she wanted and called out the evil that was being plotted against her people (Esther 7:1–6). She brought deliverance. Because of Esther’s courage, the Jews defeated their enemies and were granted a powerful victory over them. The king ultimately bestowed great honor upon them and granted high position within his kingdom to Mordecai. As we look at the days in which we live, may the story of Esther give us courage to raise our children to be the spokespeople of our day. The responsibility rests on our shoulders. If we do not rise up and challenge the culture and teach our children to become “Esthers” in their world, then we have failed and will see a generation perish. The calling we have is not for the faint of heart, but it’s the one God has given us. Lord, help us to be Esthers is the day in which we live. When the culture has plans to annihilate Your truth, help us to be bold and unapologetic in our stand. Help us to recognize the responsibility we have and to know that we and our children have been placed here “for such a time as this” (Esther 4:14). Amen. In our home just lately, we have been talking a lot about the power of words. Having a house full of teens, we tend to have a lot of joking, teasing, and, might I say, “trash talk” between them all. Oftentimes this back and forth is done in good fun and with seemingly no ill intentions. However, at times it can become, in my opinion, cutting and negative; I would even go as far as to say it can be hurtful and disrespectful. As parents of teens, my husband and I no longer send our kids to their rooms for being mean or disobedient. Those days are long gone. I am thankful that we are at a stage in our lives with our children that instead we are able to sit down, open God’s Word, and see what it has to say about any issue we might have to address. You see, if our children don’t hear from the Lord Himself, then our words of correction can become repetitive and mute. If we don’t show them why they shouldn’t do a certain thing or act a certain way, then they will never truly understand their place in God’s kingdom and their personal responsibility to live Christlike lives. In our discussions over the past few days, I have realized that it isn’t only my children who need to learn about the power of the tongue. As a mom, I need to realize the power my own words have. They can bring life to my kids’ spirits, or they can bring death. Before I deal with my children, I need to deal with my own heart. 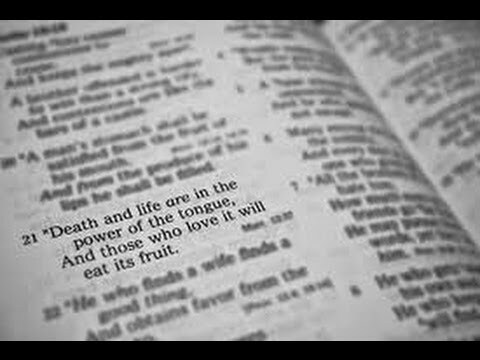 Proverbs 18:21 says, “The tongue has the power of life and death, and those who love it will eat its fruit” (NIV). The Good News translation put it like this: “What you say can preserve life or destroy it; so you must accept the consequences of your words.” Personally, at times I become so run by my emotions or moods that my tongue becomes unhinged and I forget that there are consequences to the words I speak. Whether I offend, cut down, or crush a little part of my child’s spirit, the result is broken relationship and broken trust. If I can’t control my tongue, I cannot be effective in communicating the love and mercy of Christ to others, especially my own children. I have seen over and over a breakdown in communication between children and their parents, husbands and wives, all because a harsh word caused hurt that in turn led to resentment, anger, and ultimately a strained or non-existent relationship. We sometimes forget the bigger picture. The devil’s plan is to divide and destroy relationships, because without unity the church cannot be effective. If the church is not effective, then God’s kingdom can not be advanced. See the plan? There are 137 verses in the Bible that talk about the tongue. Obviously, how we use our tongue is of great importance to God. In Scripture the tongue is often referred to as a sharp, divisive weapon, used to cut and tear down. But is also called wise, soothing, and able to bring healing. It can be used to alienate, but it can also unite and lift up. The choice as to how we use our tongues is ours. So how do we in times of frustration and irritation pour out honey instead of acid? How do we lead our children by example? Because remember, to expect something of them that we are unwilling to do is hypocrisy. The answer is in daily surrender. Daily surrender to the One who is able to change our hearts and convict us of our need for Him every moment of every day. It’s in realizing that what comes out of our mouths is in direct relation to what is in our hearts. We cannot control our words in our own efforts. Like those New Year’s resolutions, we start strong and ultimately fail. It is only through the power of the Holy Spirit that we are able to die to our flesh and become the people, the moms, the parents that God has called us to be. In those times when we want to respond in a way that is contrary to the nature of God, may we be willing to stop, take a step back, and ask, “Does this bring life or death?” We should be thankful when the right response comes, but we must be willing to humble ourselves and ask forgiveness when our flesh and our tongues supersede the Spirit! I challenge you to step out and ask God for help. He is faithful and will meet you right where you are.